You are here: Home / Impact / Honey can you play a tune? The Gift of Music Foundation was very happy to assist radio station 104.7 The Fish with their annual “FISH Christmas Wishes” campaign. We found a few wonderful young people who had dreams of playing music, but circumstances made it net to impossible for them to have the instruments they needed. Here’s just one more WIN that happened because of our supporters of The Gift of Music Foundation! Honey lives in Union City and is being raised by her grandmother. She is an aspiring musician and recording artist, but she really LOVES the drums. 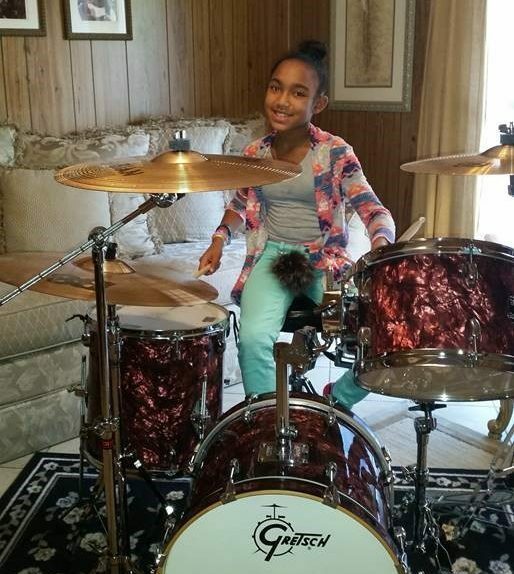 There was simply no way that her grandmother could have purchased a complete drum set on her own. Thanks to a request from The Gift of Music Foundation, an amazingly kind donor stepped up and donated a drum set! We were able to placedit directly into the home of the happy new percussionist.